Norway Center for Health and Rehabilitation welcomes you, and thanks you for choosing our center for your healthcare needs. An exceptional community healthcare resource for many years, we exceed expectations in meeting the needs of individuals who require short-term skilled nursing care. Our staff of concerned and dedicated professionals is committed to helping everyone through providing support and guidance on a one-to-one basis. Whether you join us for a brief stay or call us your home, we want you to feel as comfortable as you would amongst family, while receiving care such as physical therapy, occupational therapy, or speech therapy. Norway Center for Health and Rehabilitation also provide a myriad of medical services including pulmonary rehabilitation, heart failure services for CHF, cardiac recovery, amputee rehabilitation, stroke rehabilitation and wound care management to name a few. Our center has yet again been recognized by U.S. News & World Report as one of the “Best Nursing Homes” in the United States and has received the highest possible overall rating of five stars. 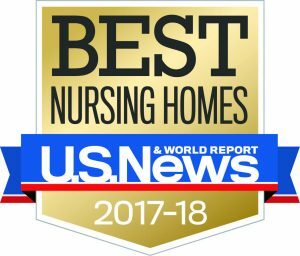 The Best Nursing Homes 2017-2018 ratings highlight the top nursing homes out of nearly 16,000 facilities nationwide. We have achieved this honor through assessments in health inspections, level of nurse staffing and quality of care. Rankings are also based upon a rating from the Centers for Medicaid and Medicare Services(CMS). http://health.usnews.com/best-nursing-homes. Norway Center has been honored with this distinction since 2014! Norway Rehab and its staff continue to give very good care to our mom. It seems that all of her needs are met in a timely manner. I’m always kept in the loop when changes occur. Best of all there’s a high level of compassion along with the high level of Service. Thank you. My mother, Elizabeth Maxfield spent time in all the areas of Norway Rehabilitation and Health Care Center—Nearly 1 year in Rehab., 2 ½ years in assisted living, 1 ½ years in nursing care. I was very please in the way she was cared for in all these areas. Our Mother was a resident of Norway Center for Health & Rehab for many years, first in assisted living, then in skilled care and finally in Long Term Care. At all times she was treated with loving care, kindness and professionalism. The staff became part of her and our family and she thought so much of them. When my time comes to enter a nursing home, it will be here. I have recommended it to many people.